It all began on a wing and a prayer in 1996. Challenges were many and since it was the first time out, there was much to learn. The “96” Cruisin The Coast event had 374 vehicles registered. That first group of cruisers who came to the Coast fell in love with the area and had a wonderful time. Each year registration numbers increased and word spread quickly that Cruisin The Coast in South Mississippi was an event not to be missed. “We struggled through those first few years because of organizational problems and financial issues but we never gave up. Now we have a really unique product that we are incredibly proud of,” Woody Bailey, one of the founders said. Today, Cruisin The Coast is the biggest special event in the state of Mississippi. It has garnered numerous awards over the years and is also one of the most popular automobile events in the country. Several thousand classic cars and trucks are registered for Cruisin The Coast 17, and the numbers are expected to grow even further. There are over 700 friendly, helpful, knowledgeable volunteers that staff the event each year, easily recognizable in their bright yellow shirts. Cruisers always congregate for the first time on Sunday, October 6, at Hardy Court in Gulfport. It is a highly anticipated event, and signals the beginning of all the fun and festivities yet to come. A Cruisin vendor for the past 18 years, E T Motor Gear, will reveal the coveted new collection of Cruisin The Coast t-shirts and collectibles while music plays from the 50’s and 60’s and takes guests back to the good old days. People come out in record numbers to get that first glimpse of those beautiful cars and will often stop to chit chat with the owners. Veteran cruisers get reacquainted with old friends and make their plans for the week ahead. The Hardy Court event is a wonderful kick off and thoroughly enjoyed by all. Be there or be square. On Monday, October 7, Long Beach is the place to be. Registered cruisers will proudly drive their classic treasures down Hwy 90, one right after another in an incredible parade that will most certainly keep heads turning. Cars will line up at 4 p.m. at the Long Beach High School and the parade will begin promptly at 5:30. This is a wonderful opportunity to see the cars in all their glory as they glide past you against the setting sun on the beach. Musical guests are the Tip Tops who will perform at the Long Beach Harbor from 6 to 9 p.m.
A brand new event joins the line-up this year! Don’t miss the CTC Salute to our Veterans, sponsored by The Hookup Bar & Restaurant and the Biloxi Boardwalk Marina. It takes place on Tuesday, October 8. It is the perfect spot for the occasion as a massive American flag waves above the venue for all to see. Musical guest, Elvis impersonator, Gary Wesley, will provide the entertainment from 10 a.m. to 2 p.m. That evening, hurry over to the Island View Casino in Gulfport for the Flame-throwing competition which begins at dusk. You don’t want to miss this one! The Biloxi Block Party will be in full swingon Wednesday, October 9 from 8 a.m to 2 p.m. All the fun takes place downtown and will be a wonderful way to spend the day. Special musical guest, Brandon Bennet, who is another amazing Elvis impersonator, will perform during the event courtesy of Hard Rock Casino Biloxi. Afterwards, cruisers and guests will be treated to a brand new event added this year, the Diamondhead Blessing of the Classics! Following in the time honored Gulf Coast tradition of blessing the fleet at the start of shrimp season, cruisers will have the unique opportunity to experience this with their cars for the first time ever. The Beau Rivage hosts another wonderful Cruisin event after dark with very special guests, Danny “The Count”, “Horny” Mike, and Kevin from the “Counting Cars” television show. Come by and meet the fellas and get autographs from 6 to 8 p.m.and look for them on Thursday and Friday as well. Louie Prima, Jr. carries his father’s big band swing sound and puts on a great show. See him tonight at the Beau and dance the night away with your sweetheart. Get up early and come hungry becauseThursday, October 10, starts the day with the Country Cruisin Breakfast! Cruise into the beautiful Long Beach Yacht Club from 7-10 a.m and enjoy all your favorites. This is the beginning of a really exciting day because there is so much to see and do. The Swap Meet opens for business at the Mississippi Coast Coliseum from 9 a.m to 5 p.m. You will find all kinds of extraordinary things to tickle your fancy. The Swap Meet will continue through Saturday, October 12, so you have plenty of time to make it over there in case you get too busy with all the other things going on. The Auto Auction also opens today for those of you interested in selling cars or perhaps taking home a new one. Thursday is the registration day only but you must be registered in order to participate in the excitement on Friday, October 11 and Saturday, Oct 12. The Mississippi Coast Coliseum is where all the action is! Live entertainment abounds with bands playing up and down the Coast. Check out sites in Ocean Springs, Gulfport (Cruise Central), Edgewater Mall, D’Iberville and Bay St. Louis. “Big Easy In The Bay” also takes place on Thursday. Visit the charming Depot district of Bay St. Louis and see why this event is such a big hit with everyone. Also, for the second year in a row, Cruisin the Coast is hosting a Gulf Coast Seafood Sampling at Cruise Central in Gulfport! Come by and try the delectable, fresh caught delights at 11:00 a.m and againat 1:00 p.m.
Next door to the Treasure Bay Casino, on the North side of Hwy 90 in Biloxi, be sure and check out the Cruisin The Coast Car Corral. The event starts on Thursday and runs through Saturday and is hosted by the Corvette Club. If you are interested in selling a car or truck and having it on display in the corral, it will cost you the very reasonable fee of $40.00 to leave it there for the duration of the event through Saturday. You list your phone number on a card, place it on the dash and interested parties can contact you about your vehicle and hopefully it will result in a sale. For the entire time, your classic beauty will be safe and sound under the watchful eye of the Corvette Club members. On Friday, October 11, and Saturday, October 12, the excitement continues with an incredible array of events on tap! 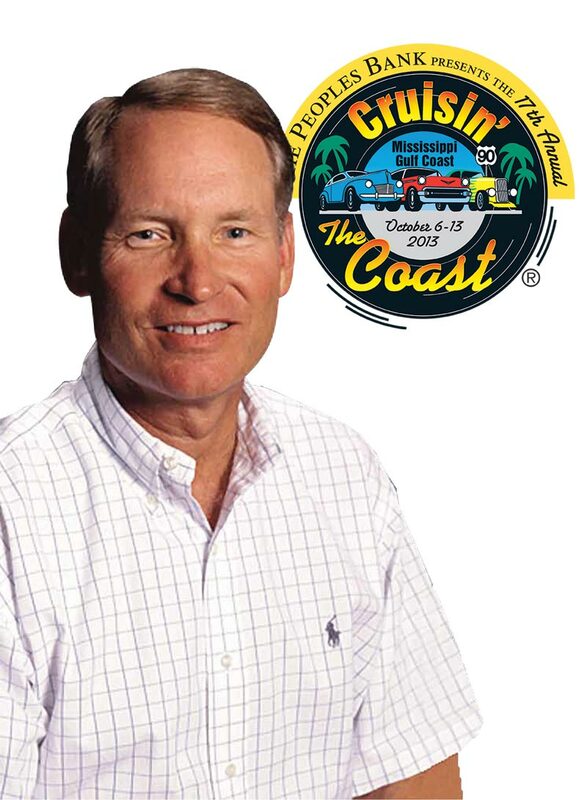 Mr. Dennis Gage, host of the very popular television series, “My Classic Car,” will be visiting the various Cruisin sites to chat with cruisers and sign autographs. Gage will be filming a special segment featuring Cruisin The Coast which will air on an upcoming episode. The Auto Auction begins at the Coliseum at 10:00 sharp and it is always an over-the-top experience that you will thoroughly enjoy. The Vicari Auction has been a part of Cruisin The Coast for many years and it is truly extraordinary. Come by as a spectator, just to watch the proceedings or come by to make that dream purchase of a lifetime. The auction ends on Saturday. Cruisin venues are open from 9 a.m. to 5p.m.with live entertainment on all stages. Tonight is Ocean Spring’s big night to P A R T Y with the cruisers at the annual Sock Hop featuring Vince Vance and the Valiants. Beautiful downtown Ocean Springs will be rockin and rollin like never before and you’ve just got to be there! For years, Cruisin The Coast has honored it’s participants and guests with an actual “Fly By” to mark the end of the event. Look to the skies above Hwy 90 starting at 3:00p.m and you will see an astonishing sight that just may take your breath away. The planes will fly from east to west then circle round and go back west to east at only 500 feet above the ground. It is a beautiful sight to see so don’t miss it. All good things must come to an end and unfortunately, Cruisin The Coast is no exception. Sunday, October 13, is the final day of merriment and adventure for car enthusiasts in South Mississippi till this time next year. CTC closes out the festivities with a grand day of celebration with big awards of cash and prizes. All registered cruisers are eligible to win if they turned in their stamped registration card. The prestigious Gene Oswalt Volunteer of the Year Award will be presented to a deserving local Car Club member. “We could not do this event without the help and dedication of our volunteers and support of our many sponsors. I so appreciate all the work they do and they are all winners,” Woody Bailey said. Dennis Gage will announce the recipients of the cash drawings. (40 drawings in all @ $500 each for a grand total of $20,000). Stroll down memory lane as NA NA SHA croons the oldies but goodies. Cruise Central remains open until 2:00 p.m. so you can pick up those last minute souvenirs and get one more look at all the spectacular cars.